We had the long awaited John Den-is lecture "KISS" recently and I have to say it’s one of the best lectures I’ve ever seen. "KISS" is a marketing acronym for "Keep it Simple Stupid" and John espouses his business philosophy (after a lifetime in advertising) in simplifying magic methods in order to concentrate on selling yourself— in his view the secret of good entertainment. He cited Aldo Colombini’s dictum "People pay you for what they see, not what you do!" 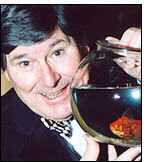 The concept clearly works as John advised that since retiring he has worked in the corporate sector performing magic in Britain, Europe, Russia, Japan, Turkey, Greece and other venues for many blue chip companies and all the close-up and parlour magic effects that he showed were directly from his programme for the last eight years. He presented this in a very engaging manner laced with plenty of gentle humour and good visual magic — magic that doesn’t have to be explained. His programme included his very well-known Ring and Cord routine (I can testify to the impact of this having seen him perform the effect for lay audiences at The Magic Circle many times) also his Pen through Mirror, a wonderful and imaginative adaptation of the pen through banknote. He also presented a very clean and entertaining routine with the standard Four Kings changing to four spot cards in the spectator’s hand under the guise of being the Fastest Sleight of Hand Trick in the World! Nate Leipzig’s Magnetized Cards (shown to him by Dai Vernon) followed and then to demonstrate the simplified thinking of his late friend Jack Avis he showed perhaps the cleanest turnover move for the Okito Box you will ever see, devised by Jack. A close-up version of the Anti-Gravity glasses (perfect for restaurant workers), then a very simple book test followed by a cheeky but strong stage presentation of Nick Trost’s Eight Card Brainwave. Finally he closed with a real stopper that has baffled many magicians for years but hitherto never released in which a freely chosen card from six displayed pasteboards proves to be the only one with a different coloured back. A real wow effect..
His logical and professional style of magic appealed to a wide number of the members as it was realised that every effect shown could be performed immediately by any magician with the addition of a good, personable presentation. Common sense but true. An excellent and inspiring lecture/presentation.